Chondrex’s well-referenced Collagen Antibody-Induced Arthritis (CAIA) antibody cocktail was originally introduced as a 4-clone antibody cocktail kit in 1998 (Arthrogen-CIA® arthritogenic monoclonal antibodies). However, to induce consistent arthritis more effectively in various mouse strains including CAIA low responder C57BL/6 mice, and a variety of unpredictable knockout and transgenic mice with C57BL/6 (H-2b) or 129/Sv (H-2b) backgrounds, Chondrex developed a new 5-clone antibody cocktail kit by adding a new clone to the original 4-clone antibody cocktail. 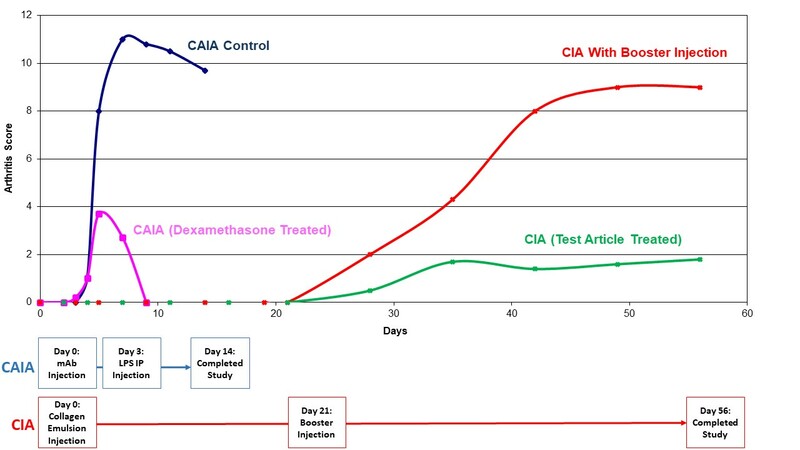 1) Faster Results: Severe arthritis is induced within 24–48 hours (Figure 1A) instead of the four weeks required to induce CIA after immunization with type II collagen (Figure 1B). 2) Broad Applicability: Unlike the CIA model, which requires a restricted MHC haplotype, the CAIA model can be induced in almost all strains of mice, including CIA-resistant, Tcell deficient, gene knockout, and transgenic mice. 3) Consistency: The severity of arthritis apparently correlates to the dose of monoclonal antibody cocktail, and more severe and consistent arthritis can be induced by increasing the dose of monoclonal antibody cocktail. Therefore, this model is ideal for studying the pathological role of individual gene products, cytokines, as well as screening and evaluating anti-inflammatory agents (Figure 1) without influences of complete or incomplete Freund's adjuvant, which strongly affects the host's immune system. IP injection of LPS (50 µg) on day 3. Arthritis developed on day 4 and reached its peaked on days 7-8.
degradation will continue to progress until day 21 (not shown). Collagen-induced arthritis (CIA) is mediated by autoantibodies to type II collagen. A similar arthritis can be induced by a 4-clone cocktail of anti-type II collagen monoclonal antibodies alone or in combination with LPS. Our original 4-clone cocktail has been used for inducing arthritis in various strains of mice, especially CAIA-high responder strains, such as Balb/c and DBA/1 mice. Chondrex developed a newly improved 5-clone cocktail by adding a new clone to the current 4-clone cocktail. 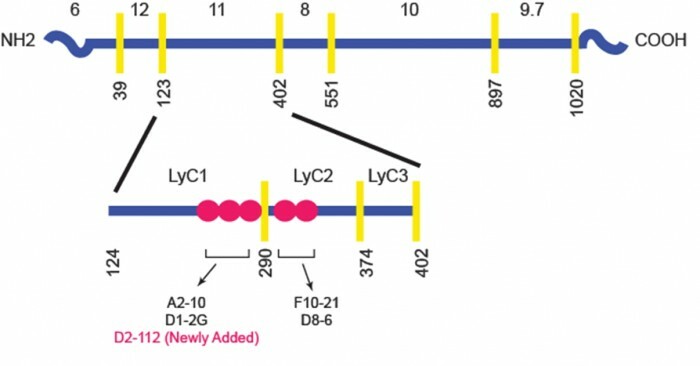 Three clones of this new 5-clone cocktail recognize epitopes located within the LyC1 (CII 124-290) fragment of CB11 (CII 124-402), whereas the other two clones react with the LyC2 (CII 291-374) fragment. The arthritogenicity of the new 5-clone cocktail is two times greater than our 4-clone cocktail and a competitor’s 4 clone cocktail, because of a high efficacy of complement fixation. The arthritogenicity of the new 5-clone cocktail was compared with the current 4-clone cocktail and a competitor’s 4-clone cocktail in DBA/1, Balb/c, and C57BL/6 mice. 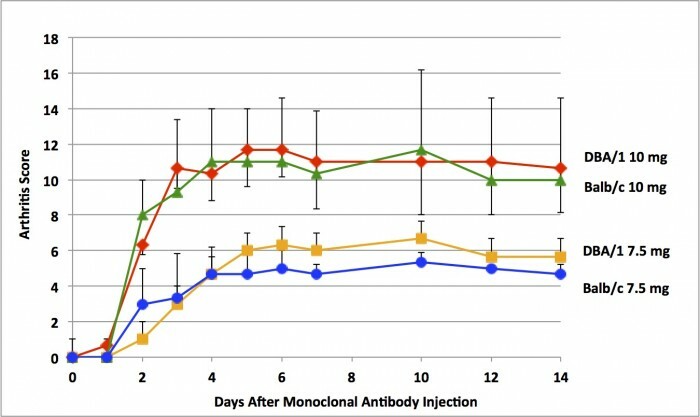 DBA/1 and Balb/c mice received 1.5 mg, whereas C57BL/6 mice received 5 mg of each monoclonal antibody cocktail, by IP on day 0 followed by an IP injection of LPS (50 μg) on day 3. Using a same dose, the new 5-clone cocktail induced more severe and consistent arthritis in all three strains of mice than our 4-clone cocktail and a competitor’s cocktail (Figure 2). 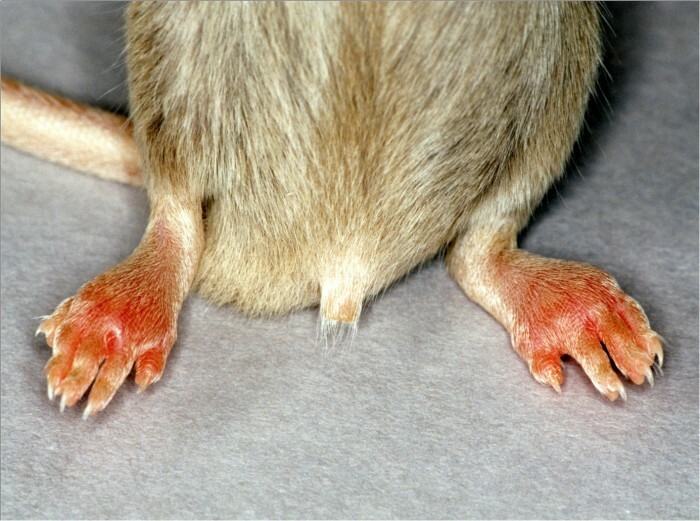 Our new 5-clone cocktail is also capable of inducing arthritis without LPS in certain conditions and strains of mice (Figure 3). Arthritis induced with 10 mg of the 5-clone cocktail is more severe than the arthritis induced with 7.5 mg. However, for unknown reasons, the severity of arthritis varied significantly among individual animals. Arthritogenic monoclonal antibody cocktail induces a similar arthritis to CIA (Figures 4 and 5). However, it is unlikely that autoantibodies alone are capable of inducing autoimmune diseases in humans. For example, bacteria toxins, such as lipopolysaccharide (LPS), Staphylococcal enterotoxin B (SEB), and M. arthritidis mitogen (MAM), play a synergistic effect with autoantibodies to type II collagen, and induces severe arthritis in mice (Figure 6). Therefore, the combination of a sub-arthritogenic dose of monoclonal antibody cocktail and LPS has been widely used for inducing severe arthritis at a high incidence in mice for a variety of purposes including the evaluation of therapeutics. 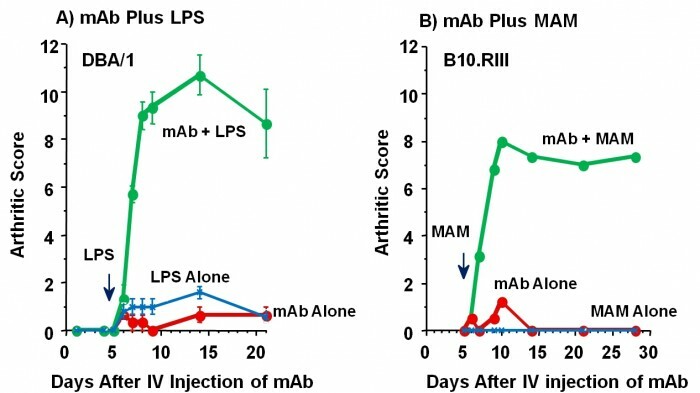 arthritis in mice: a) Monoclonal antibody plus LPS in DBA/1 mice, and b) Monoclonal antibody plus Mycoplasma arthritidis mitogen (MAM) in B10RIII mice. CAIA bypasses the requirement for host’s generation of autoantibodies to type II collagen, thus can be induced in mice that do not possess CIA-susceptible MHC-haplotypes (H-2q and H-2r) such as various knockout or transgenic mice. All strains of mice, which are normal with respect to mounting an inflammatory response including complement activation, should be susceptible to CAIA. *: Develop CIA by alternative immunization with CFA containing high concentration of M. Tuberculosis. Animal models have contributed to remarkable advances in the understanding of numerous human diseases. As invaluable as animal models are, some drawbacks do exist. One such drawback stems from the different sources of variability which can affect the outcome of the experiments. Therefore, a pilot study is generally recommended for first time users of all animal models. A brief discussion of the 2 main points of variability will be explained below. The genetic background of mice, even in the same strain, will vary from vendor to vendor and can affect how the animals respond to various reagents, thus impacting the results of your experiment (1). Therefore, testing animals from different vendors using a defined protocol is recommended before proceeding with a large full-scale experiment. The bacteria flora is very important to the health of the animal, including the proper functioning of the immune system (1). Therefore, we recommend housing animals in Specific Pathogen Free (SPF) conditions rather than conventional conditions to avoid variability caused by bacteria. The arthritogenic epitopes are not evenly distributed along the type II collagen molecule, but are apparently clustered within certain regions of type II collagen depending on MHC types in mice, such as cyanogen bromide (CB) digested peptide 11 (CB11) in DBA/1 (H-2q) mice (Figure 7) and CB8 in B10.RIII (H-2r) mice. Importantly, a similar restriction of autoantibody-CB peptide reactivity is observed in patients with rheumatoid arthritis. For example, autoantibodies from one group of patients dominantly react with CB11, whereas autoantibodies from another group react with CB8 and CB10. NOTE: These scattered epitopes found in individual patients cannot be considered as arthritogenic epitopes, because clustered epitopes located in specific regions of the type II collagen molecule may play a role in fixing and activating complement. Figure 7 - Localization of dominant arthritogenic epitopes on type II collagen molecule. However, it is likely that a mixture of antibodies recognizing minor epitopes scattered along the type II collagen molecule is also capable of inducing arthritis in mice, because the distance of antigenic epitopes lying astride the two collagen molecules may be close enough in proximity for complement fixation.